As locals will tell you, the 4th of July events and fireworks shows on Siesta Key are always fun-filled, exciting and memorable. Sarasota really knows how to celebrate our nation’s independence! There’s always something happening on the island including a popular annual fireworks show, parade and other events. Or you can always make the quick trek to downtown Sarasota or Bradenton where there are even more events, fireworks shows and exciting activities going on. If you’re going to be on a Siesta Key vacation for the 4th of July this year and you aren’t sure where to go or what to do yet, we’ve got you covered with our suggestions for the top events on the island! 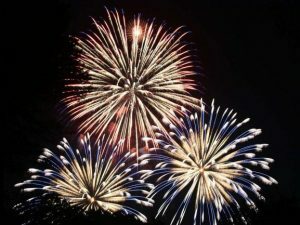 Every evening on the 4th of July, the skies above Siesta Beach at 948 Beach Road, Siesta Key, FL are illuminated with red white and blue as a huge number of fireworks are launched into the dark night sky. The Siesta Key Fireworks shower is completely free and a fun event for the family to attend. It is estimated that around 30,000 people show up to watch the fireworks each year, so that should assure you that it is not something to be missed! Although the fireworks start at dusk, the beachfront is festive throughout the day. Travelers and local Floridians set down their chairs, umbrellas, blankets and beach towels and enjoy picnics. Street vendors set up their temporary stalls selling tons of delicious snacks – from corn dogs to sweet churros. As the event is likely to get incredibly busy, make sure that you get one of the best viewing spots by arriving to Siesta Beach early in the day, securing a good spot, and spending the day at the beach before the fireworks commence at around 9:15 p.m.